For the first time since some school libraries were shuttered during budget cuts in 2008, all of the LA Unified school libraries will be back up and running when school starts again on August 16. But according to the latest district estimates, the majority of students across Los Angeles will still be forced to rely on under-stocked library collections filled with outdated materials. District numbers show that the average age of a book in a LAUSD library is now more than 20 years old, and that the books-per-student ratio is a shocking 35 percent below the state average. Even more dire: Most district schools have only a minimal budget to spend on bridging this gap—if they have any additional library funds at all. Some school libraries were closed well before the 2008 cuts — stretching back 10 or even 15 years — and some principals decided to completely close the school libraries rather than depend on parent volunteers to run them, since they may mix up books and cause more confusion. Also, some libraries are staffed through funding by PTAs, and books are replenished by book fairs or school fundraisers, meaning that school libraries in more affluent areas now bear little resemblance to those in poorer neighborhood. 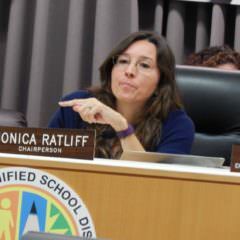 Concerned about the decline of school libraries, school board member Monica Ratliff initiated a Modern Library Task Force that issued a report in June 2014 that suggested three years of strategies for the district try to reach the California school library standard of 28 books per student. At the time, LA Unified had only 17.6 books per student. Today, district numbers show, that number has only increased 1.1 percent to 17.8 books per student. 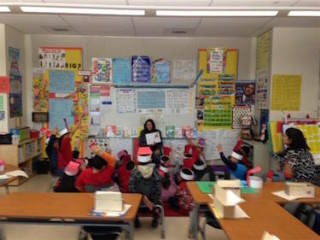 Monica Ratliff reading a book to children at a classroom. Ratliff said the district must figure out how to update the books and find donors willing to help. All the books now at the district are worth an estimated $205 million. The second-largest school district in the country has not had a major influx of books for its libraries since some state funding between 1999 and 2002, according to district officials. In 2011, as part of a civil rights settlement with the federal government, LA Unified had to pay for Library Aides at 80 schools with significant African-American student populations. Library Aides are usually hired for elementary schools and Teacher Librarians hired at middle and high schools can also teach classes. The Teacher Librarian-to-student ratio at LA Unified is one Teacher Librarian for every 5,784 students, which is far below the national average of one for every 1,026 students. (The recommended ratio by Modern School Library Standards is one for every 785 students). Under Superintendent John Deasy, librarians and aides were considered unnecessary and cut during the recession, but his successor Ramon Cortines vowed to reopen all of the libraries starting with high schools. Now, Superintendent Michelle King has renewed efforts to get libraries opened at all the schools again by rehiring staff, but it’s a far cry from the more than 800 Library Aides once working at the district. Elementary schools with smaller libraries (10,000 books or fewer) usually hire Library Aides, and this year, the district has 356 of them, with 184 paired to support two school sites. Of those, 133 are assigned six hours a day at a single site and 39 are assigned three-hours at a single site, according to district spokesperson Monica Carazo. Only three Library Aide positions are vacant and are expected to be filled before the beginning of school, Carazo said. Of 85 middle school libraries, 38 have full-time positions funded while four have part-time positions. Other positions are paid with discretionary money from the school funding, sometimes with help from PTA groups. Of the 84 high school libraries, including span schools from 4th to 12th grades, 74 have full time Teacher Librarians who also teach classes, and 10 schools have part-time positions. 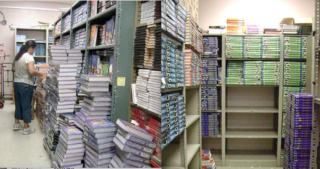 The district built 130 new schools in the past 15 years and so those book collections are newer, and the district is emphasizing their use of a “weeding” process to cull older books. 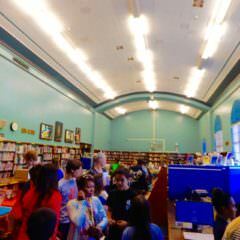 Walter Reed Middle School’s library at open house. But after books are weeded, there’s no money to buy replacements. The budget for new books last year for Tiffiny Federico at Walter Reed Middle School in Studio City was $1,800 — about $1 per student. That’s how much they raised at the Scholastic Book Fair, selling books to students and parents, with a percentage going back to the school to buy books for a classic library with high ceilings built as part of the FDR Work Progress program in 1938. After 22 years of teaching English at Reed, Federico took over the Librarian Teacher position last year and began looking through the 22,000 catalogued items they have, including VHS tapes and DVDs. She weeded out about 10 percent of damaged and outdated books. In her first year of training, Federico heard about other school libraries that were re-opening after 15 years and getting their inventory online. She teaches students at every grade level how to conduct research and use the LA Unified’s 18 data systems, how to find sources, and how to avoid plagiarism. The library is one of the hubs of the school, and home to those training for the Spelling Bee, the Knitting Club and the Doctor Who Club that Federico runs. It is open at least 35 hours a week, before and after school and during lunch. “If the students can’t find something, I send them to the North Hollywood Library where they have a big Manga (Japanese comic book) collection, and I tell the kids to ask them for a book because they have better funding to purchase it,” Federico said. To keep students coming back, Federico is planning a section of the library called a Maker Station that includes art supplies and science kits for students to work and create things. 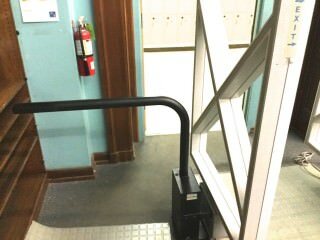 The book theft detection device at Walter Reed that doesn’t work. Another issue for Reed, and a big secret, is that the book detection bars at the doors of the library haven’t worked for at least two years. The scanners are supposed to sound off if an unchecked book passes through it. “We keep them up because it still serves as a deterrent and the kids think it still works, but it will cost about $13,000 to replace it, and that’s unlikely to happen,” Federico said. Lost or stolen books are yet another problem. Books cost about $25 each to replace, not including the cost of processing and filing them. Meanwhile, the district’s Integrated Library Text Support Services promotes its library services and even has a photo gallery of libraries before and after as they are renewed and re-opened.